If a trip to Las Vegas seems a little excessive just to get your gaming fix then perhaps a satisfactory substitute might be this Vegas-themed online slot with some unusual gameplay mechanics; it’s called Slots of Money and it’s developed by betdigital. Slots of Money plays out on a grid with three or four rows and wins are formed by landing at least four matching symbols connected together anywhere on the reels; there are no spinning reels, each position spins on its own to reveal a symbol. 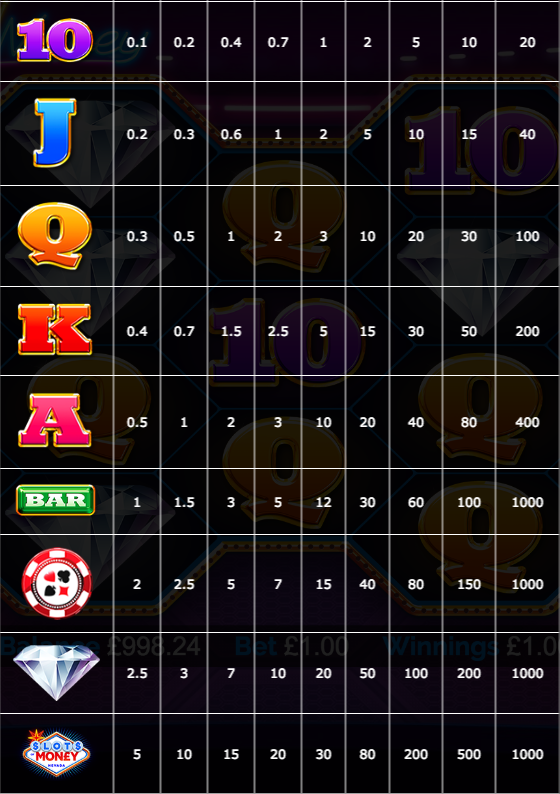 The familiar high value symbols include a Nevada sign, a huge diamond, a casino chip and a green bar; lower values are the standard 10, J, Q, K and A.
There’s no wild symbol in Slots of Money and the only special icon is the mini-slot. Mini-Slot Bonus Flip – a random number of mini-slot spins may be awarded after a losing spin. Flip It Again – may be awarded after a losing spin, the symbols will flip once more to reveal a new set. Cash Connection – during a spin every position may show ‘Pick Me’, just select one and all of those symbols will lock in place for four respins. Additional matching symbols will also lock and the payout is made when the spins end. Casino Chip Bonus – may be awarded on a losing spin if at least two casino chips have landed; pick one for a cash prize. 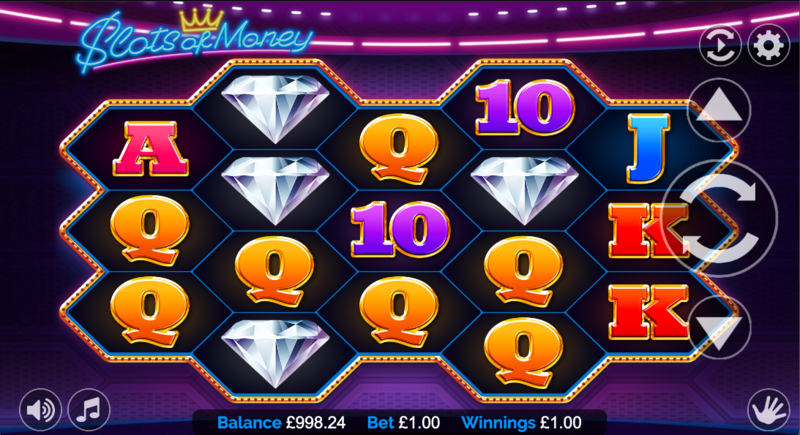 Slots of Money is something a little different from betdigital and its a slot with plenty to offer – there are loads of randomly-awarded features plus a mini-three reeler to keep things interesting and some Las Vegas lounge sounds to accompany your gameplay. It comes with an RTP ranging from 94.58% – 95.50%.